Donegal’s only representative in the upcoming European Elections said he was both “surprised and delighted” to be the only local name on the ballot paper. And with the recent withdrawal of sitting MEP Marian Harkin, 30-year-old People Before Profit candidate, Cyril Brennan from Lisahullly, Ballyshannon. is the only candidate from the north west Donegal/Sligo Leitrim area. The father of two, who is a HSE employee, said the HSE contained some “institutional rust” and described the new CEO’s salary as “obscene”. He also said it was time that real manufacturing jobs came back to Donegal and the north west which would be much better than the lower paid tourism jobs that the government are promoting. “I am surprised that I am the only candidate for Donegal and am surprised that Fianna Fáil and Sinn Féin have not put forward a candidate,” he said. 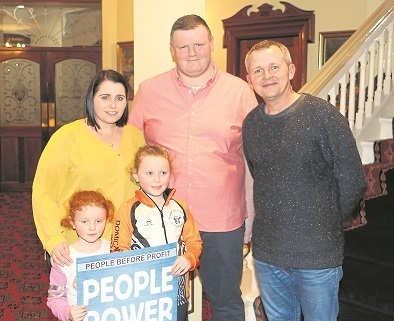 “This is their stronghold and Donegal has always been a republican county yet they have not chosen a candidate after running two candidates five years ago. “But I am delighted to be the only candidate as it is a great chance to raise the profile of the party, not just in Donegal but in the north west. He added: “Europe-wise we should not be supporting an effective European army with the EU. “We need to get money to invest in public land and to get away from the current government’s privatisation policies. Mr Brennan said the “people of Donegal have been forgotten with austerity from successive governments”. “The 'recovery' is in the big cities and it has yet to come to Donegal, he said. “We need the Common Agricultural Policy from Europe to be more evenly distributed, too many farmers are leaving the land. “We also need more control over our fisheries and there are huge trawlers over-fishing in our waters”. On jobs in Donegal and the north west, he said: “The government have been pushing tourism and low paid jobs for years, but we need to get past that and get back the jobs that we have lost to other European countries. “We can achieve that by making sure that Donegal is an area to do business and the proper infrastructure is in place and the big thing now is broadband in this technological age. “We are still struggling to get broadband. “And we need to get two more Bank Holidays and move towards a four-day week”. “There is institutional rust where managers are replaced and nothing changes, we need to re-evaluate it. “The hospitals are in a mess but the reason there are no street protests is because the organisation is so big and affects so many people”.